Leicester City boss Ian Holloway has confirmed that the planned loan move for Aston Villa's Isaiah Osbourne has been cancelled. Holloway had expected to complete the loan signing of the 20-year-old in time for Saturday's game at Norwich City. But Aston Villa boss Martin O'Neill recalled the midfielder because of mounting injury concerns. Holloway told the Foxes' website: "It's disappointing, but these things happen. We'd still love to have him here." 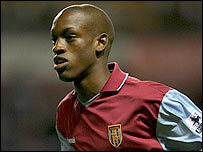 Osbourne came through the youth ranks at Villa and signed a three-and-a-half year deal in December 2006.